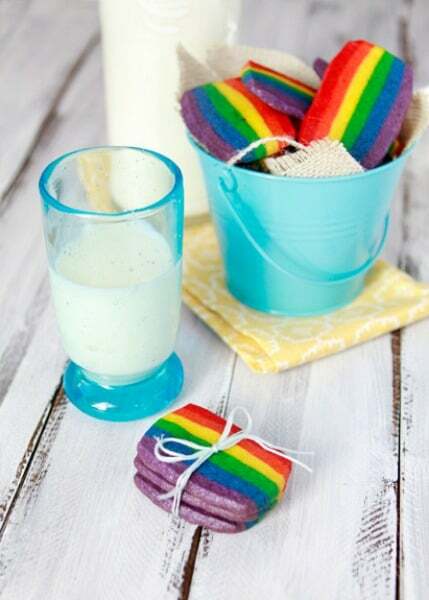 These colorful rainbow desserts are perfect for both St. Patrick’s Day or a rainbow-themed birthday party. I love all of the bright colors! Want to see the full recipe & tutorial for any of these ideas? Simply click on the title of each and it will open up in a new window for you. Thank you to the talented ladies who agreed to have their work featured here! 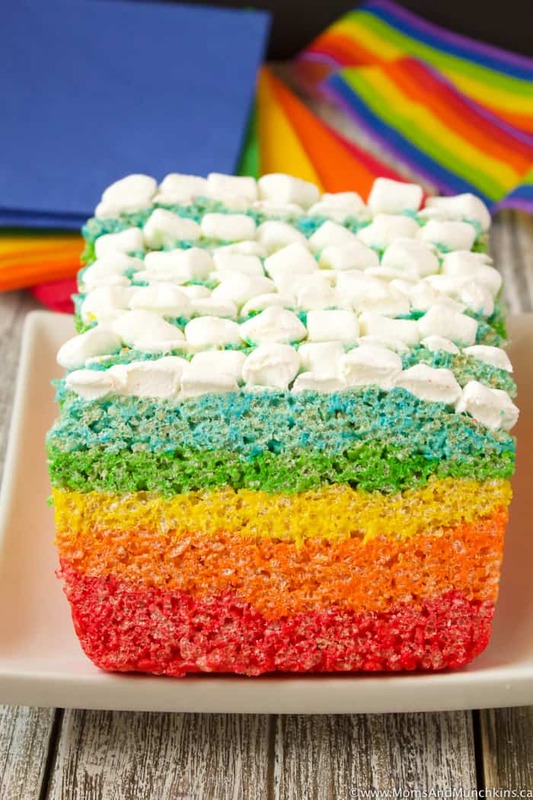 Let’s kick off this tasty collection of desserts with my Rainbow Rice Krispie Cake – so easy to make! 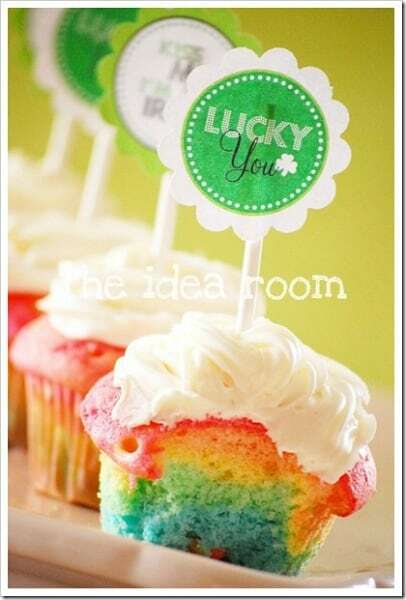 I love these rainbow cupcakes by The Idea Room! The swirls of bright colors turned out so pretty! 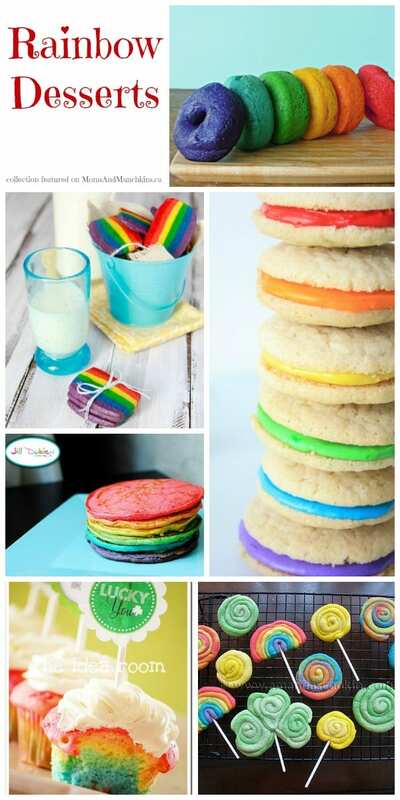 I love how bold the colors are in these St. Patrick’s Day slice & bake cookies by Good Life Eats. You can save this recipe for other occasions with new colors like green & red for Christmas or red, white and blue for July 4th! 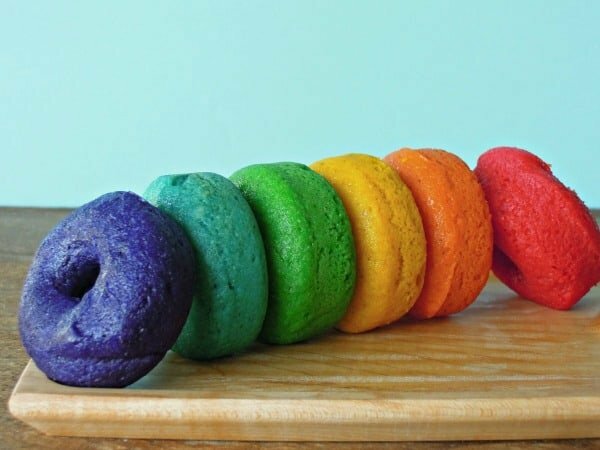 These rainbow donuts by Fork & Beans are so unique! You could display these on your dessert table stacked on top of each other with kabob sticks. I love cake pops! 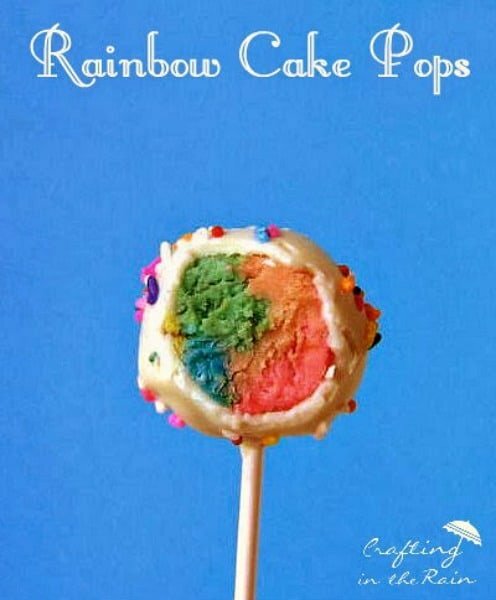 These rainbow cake pops by Crafting In The Rain would be perfect with rainbow sprinkles. 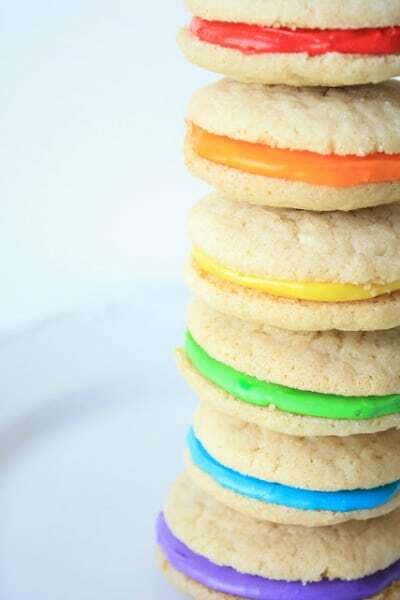 These vanilla cookies with rainbow filling by Munchkin Munchies are so pretty! Think of how cute these would be stacked in a clear treat tin as a gift for a friend. 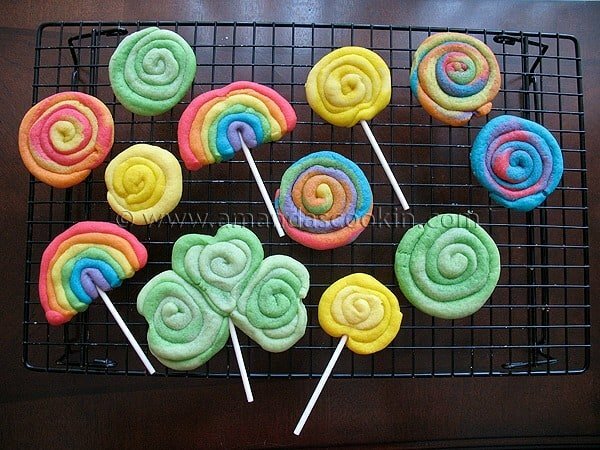 The kids will have so much fun eating these St. Patrick’s Day cookie pops by Amanda’s Cookin’. She provides an easy to follow tutorial to help you make your own cookie masterpieces. 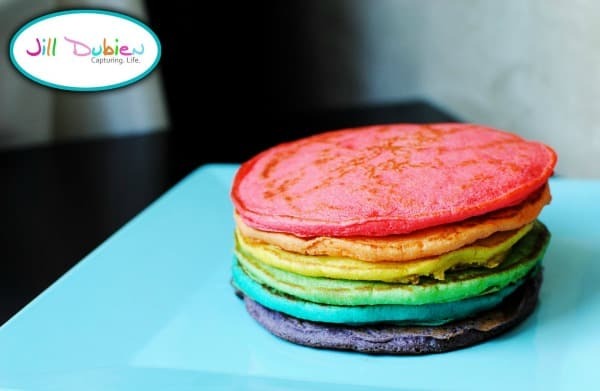 Your St. Patrick’s Day celebrations can start first thing in the morning with these delicious rainbow pancakes by Meet The Dubiens. You could top them with whipped cream and a few rainbow sprinkles. Visit our St. Patrick’s Day page for even more delicious ideas, free printables, party ideas, activities and more! We’re always adding new ideas for family fun. Stay updated on the latest ideas by following us on Facebook, Twitter, Pinterest, and Instagram.